Australian pineapples are mostly grown in Queensland, with the major growing regions including south-east Queensland (particularly the Sunshine Coast hinterland, Maryborough and Wide Bay areas), the Yeppoon area and North Queensland, including Mareeba and Mossman. A small number of pineapples are now also grown in the Northern Territory. There are approximately 35 million pineapples produced each year in Australia thanks to a labour of love by our farmers. 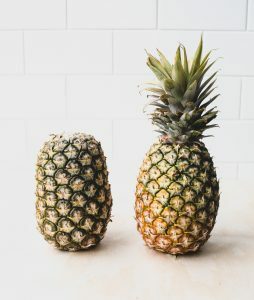 Pineapples are a multiple fruit, which means they grow from a cluster of up to 150 fertilised flowers that join together. Pineapples take up to two years to be ready for harvesting. After a pineapple has been cut from its parent plant another fruit will start to develop called the ratoon crop. Once this ratoon crop is harvested the plants are usually mulched into the ground and the tops from previously harvested fruit (or slips that form within the original plants) are planted to begin the cycle again. This explains why some pineapples in the shops don’t have crowns. New fruit can grow from these crowns or the suckers of the plant (not from the seeds), with an individual plant able to grow anywhere between 60-120 cm high. A pineapple’s parent plant is the leafy part from which the pineapple blossoms. The parent plant’s blue-green, sword-like leaves are arranged like a spiral staircase and these leaves ingeniously retain moisture, making the pineapple a crop that can survive in very hot, dry conditions. The pineapple’s flowering stalk emerges from the centre of the leaf coil, as a cluster of flowers, which are purplish to lavender in colour, and appear about 16 months after the pineapple has been planted. Pineapples are a multiple fruit, which means they grow from a cluster of fertilised flowers that join together. The flowers are also known as the eyes of the fruit and there are approximately 150 on each mature pineapple. 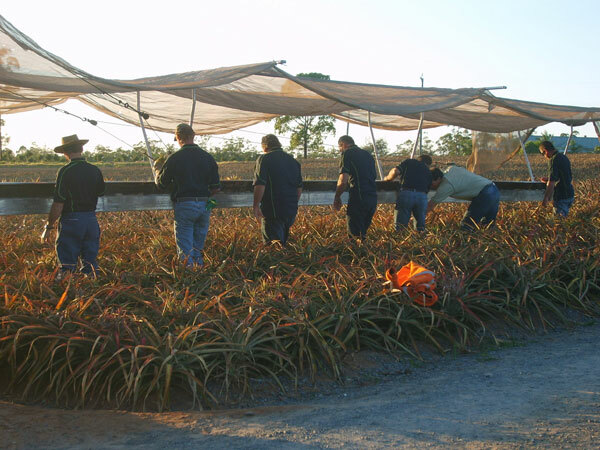 Growing pineapples is a labour of love done by farmers who are experts on the fruit and its cultivation. Each grower has a deep knowledge of how the unique combination of soil, climatic, drainage and topographic characteristics of their individual farms impacts the crop. Pineapple farmers work towards best practice guidelines for nutrient, pesticide and erosion management, have a range of business, marketing, managerial and leadership skills and the ability to report against food standard assessment criteria. Pineapple growers are also operate a range of machinery and work strategically towards developing and meeting supply contracts that fall further into the future than most crops, due to pineapple’s longer cropping cycle.